However Improbable: "That's why horses don't give speeches." "Horses don't have weddings either." "True. But we do have bridles." "That's why horses don't give speeches." "Horses don't have weddings either." "True. But we do have bridles." I've been unable to find book two in the Guardian books. I don't like reading books out of order but when my library got book three in I snatched it up and read the first bit carefully in case there were any spoilers from book two. I found one or two but not enough to ruin everything which happened in book two, so I read the rest of three. 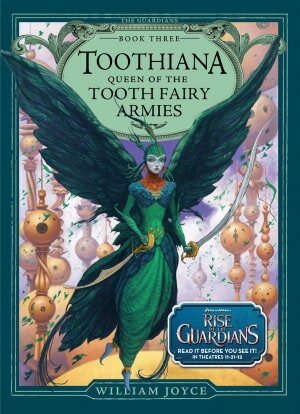 Toothiana: Queen of the Tooth Fairy Armies. The best part of this book is that North was still in it. Still slightly reckless, he's now much wiser and compassionate, but he still has his wild moments (especially when it comes to Bunnymund.) I cannot WAIT for Bunnymund's book! I like him already. He's not used to humans and their emotions and prefers his chocolate to them. The arguments he gets into with Ombric and North are very funny. The best part is when the three get into an argument on how best to help Kathrine get to sleep. Toothiana is a fun character as well. Though wary of all grown ups, she adores children and joins up with the guardians so she can help save Kathrine. She's much like North. When things don't go the way she'd like, pull the swords out. I shan't say much about this book for the sake of spoilers, but it is just as good as North's book. And the best part? When I finished it I discovered that it book four Jack Frost will finally be showing up! HUZZAH!! That one cannot come out soon enough for me. Now, about my new author picture. As I said, I had planned to sneak into my photographer's house, Mission Impossible style, to get it. Knowing how to do this is handy for one who plans to take over the world, and I was very successful in my mission. Sure, I nearly decapitated myself tripping over the cat, but we shall ignore that. You must pardon my hair of course. Pools have that effect on hair. And, here it is. Again, thanks to William for taking it for me. Don't forget, tomorrow I have a special spoiler for all of you. Quote is from the last Ranger's Apprentice books, The Lost Stories. A conversation between Will and Tug, his horse. Oh, dear. I honestly doubt that I would ever be brave enough to go to the pool in winter - much less have pictures done in a swimsuit. Sleeveless pixie-dress, yes. Swimsuit, no. It definitely sounds like an interesting series! I'm intrigued about the movie now... Perhaps I'll see it when it comes out on DVD. Very nice pictures! I do hope that pool is heated, though! Oh my word, did you see the new E-Lock? Gah! I'm bursting! It certainly is different than Sherlock. I really want to see The Rise of the Guardians movie! I need to finish the Rangers Apprentice books, I have the first three but our library didn't have the rest of the series, I'll have to look at this new one and see if I can find them! Sneaky! That is Ninja sneaky. Well played, Jack. Is that a hot spring with steam rising up in the photo? Regardless, I love your new author picture! Toothiana sounds fun. That is a gorgeous cover picture. Congrats on your successful mission! :) And it is a very nice author photo! I suppose those are a few more books to add to the stack. Yes, the comic is available on Nook! (Well, at least Nook color/Nook tablet. Not sure about any other nooks...) It is very easy to read it, as there's the magical pinch-and-zoom feature if the text is too small for you. However, I did not find the size of the text a problem.